There was a fight for a loose ball. 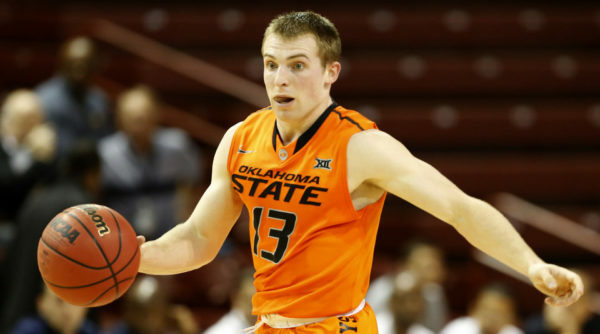 Oklahoma State’s Phil Forte III dove on to the hardwood, extending his arm in an effort to get a paw on the ball. A Towson player also dove for the ball, landing squarely on Forte’s vulnerable left arm. His entire arm hurt from the impact, but it was the elbow that bore the brunt of the pain. The date was November 19, 2015. After starting the team’s first three games of the new season, Forte would go on to miss the remainder of last season with nary a thought about whether his head coach, Travis Ford, would return. The inevitable coaching change occurred. 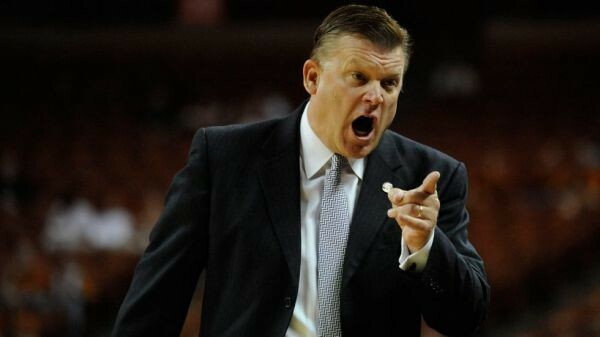 Ford was fired after a miserable 3-15 Big 12 season and Brad Underwood was brought in to restore Oklahoma State’s legitimacy as a basketball program with frequent forays into March. On the day Underwood was unveiled as the new head couch, Forte told the media that he too, indeed, would be back in Stillwater this fall. “It’s these teammates,” he told reporters on March 23. “It’s the fans. It’s the community. It’s Stillwater. I just can’t see myself going anywhere else. I can’t see myself putting on another jersey, another uniform.” Last week, the Big 12 Conference released its list of preseason superlatives for the 2016-17 season. Everything looked fine. The All-Big 12 team looked fine. Its conference freshman and player of the year picks looked fine. There was not one name on the list that you could argue did not deserve the early acclaim. However, there was one name that deserved to be grouped in with the others but was somehow missing altogether from the press release: Phil Forte III. One of the most attractive jobs in the conference opened up on Friday when Oklahoma State parted ways with Travis Ford. While five bottom-half finishes in six seasons may not suggest much allure to the gig, strong facilities, access to the lush recruiting hotbed of Texas, a winning tradition and avid fan and donor support (when the team performs) were enough to sway former Stephen F. Austin head coach Brad Underwood to come aboard just one day after his Lumberjacks exited the NCAA Tournament. Much like a baseball prospect who’s mashed his way through the minor leagues, there was simply nothing left for Underwood to prove at the mid-major level. His Stephen F. Austin teams went 59-1 in conference play over three seasons, winning the Southland Conference tournament each year he was there and bringing that same fire to the NCAA Tournament, winning two games as a double-digit seed and pushing a good Notre Dame team to the final second over the weekend. Underwood’s resume was overwhelming even before this season’s Second Round run, but the postseason certainly elevated the demand for his services, making it clear that the time had come for him to find a bigger challenge. Underwood will find just that in the Big 12, whose coaches have a combined 43 Sweet Sixteen trips and eight Final Fours to their names. The biggest hurdle he’ll have to clear will be the demanding task of recruiting in Stillwater’s backyard, but his ties to the area as a McPherson (Kan.) native and as a two-year player at Kansas State and assistant under Bob Huggins and Frank Martin suggest he’s more than capable of doing the job. Three straight bottom-half finishes and zero NCAA Tournament wins since 2009 had long been enough for supporters of Oklahoma State to separate themselves from Travis Ford, but it wasn’t until today that it became enough for athletic director Mike Holder. As the curtains fell on another disappointing Cowboys season, so too did they fall on Ford’s mostly empty tenure in Stillwater, as he was fired from his head coaching post on Friday despite three years and $7.2 million remaining on a generous extension he signed seven years ago. If Ford still had defenders, they would point to the laundry list of injuries suffered by key parts of this year’s rotation that caused the season to run off the rails, resulting in a lackluster 18-14 record and ninth-place finish. To an extent, they’d have a point. There’s no doubt that this season would have yielded better results had Phil Forte not hurt his elbow in November and had Jawun Evans not been lost for the last 10 games of the season with a shoulder injury. However, multiple disappointing finishes depleted Ford of the capital to write off another one, with five bottom-half finishes in the last six seasons no longer enough for the leadership of an otherwise proud program to overlook. 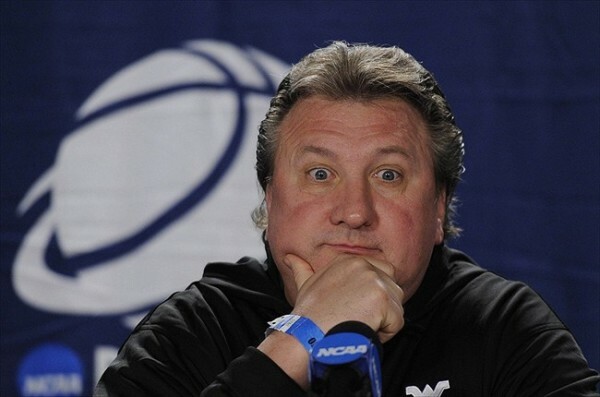 West Virginia is a basketball team. A very solid basketball team, in fact. A team whose hallmark is to press the life out of opponents. A team that scores easy baskets off turnovers. A team that makes its fans cringe when it clangs jump shots off odd parts of the backboard. The Mountaineers started 4-0 in Big 12 play playing the good ol’ West Virginia way before losing back-to-back games at Oklahoma and at home to Texas. In the four games since those defeats, it appears that we’re seeing a different West Virginia team. Not only have the Mountaineers gone 3-1 in that span, but their three-point shooting has improved (35 percent in their last four games; 31 percent for the year) as well as their free-throw percentage (73.4 percent in their last four games; 66 percent for the year). Tuesday night’s win at Iowa State marked the first time a team other than Baylor or Kansas has defeated Iowa State in Ames since the start of the 2012-13 season. 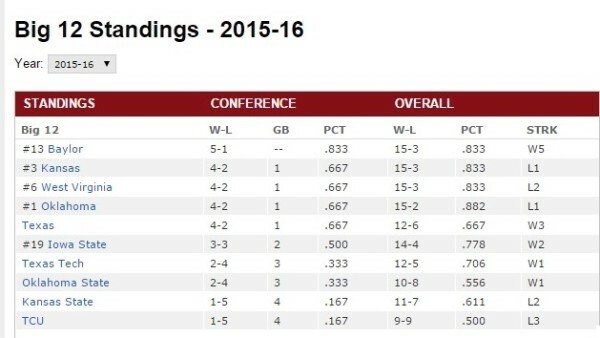 Bob Huggins‘ team now finds itself in a first-place tie with Oklahoma with nine games still to play. The Mountaineers are very good and they can no longer be ignored. We’re almost four weeks into league play, which typically means a select group of contenders have asserted themselves and are heading for the summit they call “Conference Champion Mountain.” It’s a grueling hike to the top, but totally worth it once you get up there. You get to look out at the rest of your conference mates with the knowledge that your better was better than their better. You think about that banner you get to hang in your arena’s rafters that will forever stamp just how good your regular season was. Then, all of a sudden, you realize that you’re up really high. You struggle to breathe. Now, you can’t breathe AT ALL. After fighting for breath, you fall off the mountain, not because of the altitude. No. You fall off the mountain because a scrappy No. 14 seed has ended your quest for a national championship before you had a chance to get out of the Tournament’s first weekend. Or, at least that’s usually how it goes in the Big 12. This season, though, has brought a special kind of craziness – one none of us could have imagined even a few short weeks ago. This is where we are now, so expect a wild and crazy edition of our Big 12 Power Rankings. Here we go. Oklahoma State freshman point guard Jawun Evans is the highest rated recruit in the Big 12 from the 2015 class not named Carlton Bragg or Cheick Diallo. In 32 minutes of action on Tuesday, Evans starred for the Cowboys in a shocking 86-67 upset over then third-ranked Kansas as Bragg and Diallo spent much of the game watching from the bench. With senior Phil Forte out of the lineup, Evans has developed into a go-to option for Travis Ford and the 22 points, eight assists, and six rebounds he tallied against the Jayhawks are just the latest evidence supporting his case to be the Big 12’s Freshman of the Year. It’s no secret that Kansas has struggled to contain driving guards like Jaysean Tate and Jawun Evans in recent games, and it might not get any easier tomorrow as the Jayhawks welcome Isaiah Taylor and Texas to Allen Fieldhouse. While Texas is merely average when it comes to finishing at the rim, it’s still worth wondering if Taylor, Javan Felix, and Kerwin Roach will test Kansas’ ability to stop penetration early. Saturday’s matchup in Lawrence will also mark Shaka Smart‘s first game against Kansas since that fateful day in San Antonio, so it’s also natural to think about whether both coaches will be a little more amped up than usual for this one. Two of the Big 12’s three most efficient offenses square off tomorrow when Oklahoma pays a visit to first-place Baylor. While the Bears currently sit alone atop the Big 12 standings, there’s still some skepticism of their record due to their relative lack of marquee wins and the fact that they have had close calls against two of the league’s worst teams. One of the great things about the Big 12’s perennial depth is that there are always opportunities to make statements, and the Bears will have a big shot to quiet their doubters with a win over a top-five team. Luke Winn of SI.com released his weekly Power Rankings (stay tuned for ours), and his insight into Oklahoma has to do with the performance of the frontcourt core of Ryan Spangler and Kadeem Lattin. The Sooners’ efficiency takes a dive when Spangler and Lattin don’t share the floor, but Spangler has played a whopping 88.6 percent of available minutes in conference play, so effectively, the concerns for Lon Kruger are finding ways to keep Lattin in games and finding the right lineup for those times when the sophomore big man needs to catch a breather. Iowa State sophomore Hallice Cooke recently put himself in Steve Prohm‘s doghouse by being late to practice one day after Prohm instituted tighter policies for player conduct, but he is hoping to get back at it tomorrow against TCU. With Prohm shortening up his rotation, it may be tough for Cooke to find more than a handful of minutes per game moving forward, but he can start by playing well against the worst team in the conference. Oklahoma State is flying high after its big win over Kansas, which prompted Tulsa World columnist Darnell Mayberry to compile a list of Travis Ford‘s ten biggest wins in Stillwater. While the Pokes have mostly been an afterthought since the departure of Marcus Smart, one doesn’t have to dig too deep to find some truly impressive wins in Ford’s eight seasons at the helm. Michigan senior guard Spike Albrecht, the star of the first half of the 2013 national title game, announced on Friday that he was ending his basketball career early due to an ongoing hip injury. Unlike Grayson Allen, who used his national championship game to catapult him into the national spotlight, Albrecht had a solid albeit unspectacular career at Michigan (to be fair, Allen was much more highly recruited than Albrecht). Albrecht, who earned co-MVP honors last season, will be most remembered for his performance in that game against Louisville where he filled in for Trey Burke, who had to sit much of the first half because of foul trouble. Albrecht also gained some notoriety for his attempt to parlay his fame into a date (or at least a response) from Sports Illustrated swimsuit model (and Michigan fan) Kate Upton. Unfortunately for Spike that does not appear to have worked out for him, but we wish him the best of luck in his recovery and whatever path he decides to pursue next. 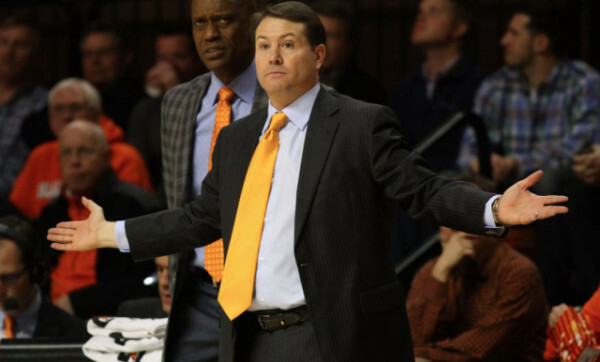 When we heard that Oklahoma State coach Travis Ford had been kicked out of his son’s high school basketball game we assumed it was an example of a coach trying to get away with his typical insolent behavior. However, that does not appear to be the case as multiple witnesses at the game said that Ford did not appear to be out of line and that the official overreacted. Now we wouldn’t put it past a coach or an athletic department to plant anonymous sources to defend a coach, but we also wouldn’t be shocked to hear that an official let the “power” get to his head. In any event, we suspect that Ford will be keeping a very low profile at games going forward. It seems like every year something triggers a group of journalists to wage war against the idea of students rushing the court. This year, the trigger appears to be Randy Peterson, a journalist at the Iowa-Iowa State game, who suffered a compound fracture when students rushed the court. Even Peterson’s admission that he tripped did not stop the journalists from piling on and trying to make it the biggest issue in all of sports. Some people might find this amusing given our site’s name, but we don’t feel as strongly about the topic as many others do. We don’t have a problem if you don’t want students to celebrate a big victory with their team on the court, but don’t make up some story to support your view. In terms of the actual practice, we have commented on the topic before (and had our words completely twisted by a national publication that said the exact opposite of what we told them) so we will just leave you with Kenny Ocker’s thoughts on the practice and the reaction to the push to ban it. 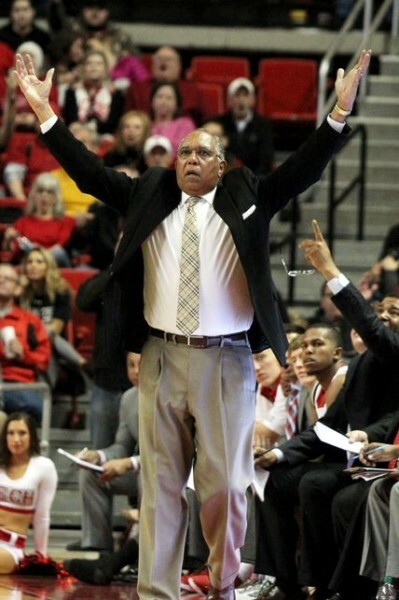 We figured that with Michael Olawakandi out of the NBA since 2007 we would not hear much about the basketball program at Pacific (other than when Bob Thomason retired), but potential NCAA sanctions can change that. The school has suspended head coach Ron Verlin and an assistant while the the NCAA investigates the school for academic misconduct. The investigation reportedly centers around Joe Ford, a former assistant, who helped student stay eligible through online courses and provided them with impermissible benefits. Ford left the school for Idaho, but resigned from that position when these reports surfaced. With all the attention that Taylor University gets for its annual “Silent Night” we are surprised that more schools don’t do something similar. This year was no different as the school got plenty of attention including from ESPN where they were featured on SportsCenter. For those of you who aren’t familiar, the students, who are just about to start finals week, dress up in their pajamas or various outfits and remain silent until the team scores its 10th point and then they essentially go crazy. It’s a neat ritual and we wish other schools would find their own unique way to engage the students more to make college basketball more an integral part of the college experience even if only for one night a year.